You do not have to run your business alone! 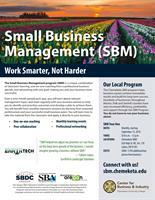 The Small Business Management program (SBM) is a unique combination of classroom learning, one-on-one coaching from a professional business adviser, and networking with one goal: making you and your business more successful. Over a nine-month period each year, you will learn about relevant management topics and meet regularly with your business adviser to help you to identify and prioritize outcomes and develop a plan to achieve them. You will benefit from monthly classroom sessions by learning from seasoned professionals and your successful small business peers. You will learn how to take the material from the classroom and apply it directly to your business. TIMES 8:50 a.m. - 12 p.m.